For over 30 years, northeast Indiana pet owners have looked to Law’s Country Kennel for their pet care needs. Our pet care services have been unique to the Fort Wayne area both for cats and for dogs. When it comes to grooming, overnight stays, doggy day care, transportation options, and nature walks, we offer a wide range of options for your pet. Contact us or visit our kennel located near Fort Wayne to see why we are your pet’s home away from home! 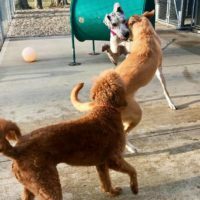 Law’s Country Kennel is located near Fort Wayne and provides a caring staff, a great pet facility, and fun activities for your pet while you are away. 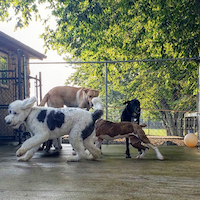 We offer a unique kennel experience that not only focuses on the care of both dogs and cats but is set in a relaxing setting in Roanoke, Indiana. Call today for dog boarding or cat boarding! Please complete the form below and present it at check-in. Law’s Country Kennel offers quality cat and dog grooming services by appointment or during a pet’s stay. Contact us for your dog or cat’s next bath or grooming. 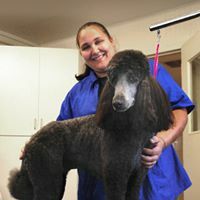 We have certified pet groomers that focus on the relationship with your pet to keep them comfortable. Schedule an appointment today! 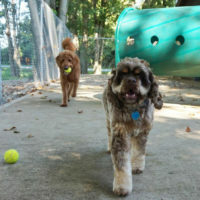 For frequent travelers and pet boarders, Law’s Country Kennel offers a Kennel Club Membership. An annual fee provides our pet customers with reduced boarding rates, additional yard play, and discounts on cat and dog bathing and cat and dog grooming services. Members receive discounted offers from company partners and priority on no-vacancy waiting lists. Contact us if you have questions about this beneficial offer!